· Centre pivots and lateral moves are increasingly being adopted by broadacre farmers. However, machine performance is often lower than claimed and should be evaluated. · Ensure the machine has an adequate capacity and high uniformity of application. · Scheduling using centre pivots and lateral moves is more complex than surface systems – tools are available to assist in assessing different strategies. · Variable rate application systems provide the potential to respond to infield spatial variability but the next generation are automated adaptive control systems to maximise crop water use efficiency. · potential for increased crop yields and irrigated water use efficiencies. Disadvantages include the additional capital cost for conversion, maintenance requirements and the higher level of knowledge and management input required to obtain the benefits. The potential to apply smaller volumes on pre-season irrigations, improved germination of crops, better utilisation of in-season rainfall and the ability to utilise deficit irrigation strategies have all been cited as reasons for the lower irrigation water use and increased crop water use efficiencies obtained with centre pivots and lateral moves (CP&LMs). However, recent evaluations of machines operating in the grains industry have found that the performance and management of many machines is sub-optimal. Inadequate system capacity is a major cause of low performance and yield potential. The system capacity is the maximum volume of water the machine is capable of supplying to a given area in a given time. It is expressed as mm/day notthe depth applied per pass (mm). For example, a machine that has a system capacity of 12 mm/day does not mean that 12 mm is applied in each irrigation event. Rather, the machine would more likely be used to apply 25 to 50 mm per pass to minimise plant and soil surface evaporative losses common with smaller applications but the machine would take between 2 and 4 days to complete a full revolution. Machines which are used to irrigate summer crops require sufficient capacity to meet the peak irrigation demands (often 12-14 mm/day) during these periods. Machines with inadequate capacity (sometimes as low as 4 mm/day) will not be able to apply sufficient water during peak periods (Figure 1). These machines are also built to run 24 hours a day, seven days a week and should be operated in this manner during peak periods. components of water losses (ie. application efficiency) and uniformity of application. Although both components are influenced by system design and management practices, the losses are predominantly a function of management while the uniformity is predominantly a function of the system design characteristics. The ability of the irrigation system to apply water efficiently and uniformly to the irrigated area is a major factor influencing the agronomic and economic viability of the production system. The coefficient of uniformity (CU) for water application by well designed and maintained CP&LMs should be greater than 90%. The variation in water application increases rapidly with small decreases in CU. Figure 2 shows an example of a typical catch transect for a centre pivot with end gun showing the variation in the volume of water being applied along the machine. Typical problems include inadequate pipe sizes, incorrect sprinkler spacing or nozzle packages, sprinkler placement around the towers and operation of the end gun affecting the system hydraulics. Appropriate irrigation scheduling (ie. both how much water to apply and when to apply the water) is important as it is closely related to crop yield potentials. Unlike surface irrigation systems, the soil moisture under CP&LMs varies across the field. This makes it more difficult to interpret point source soil moisture measurements. 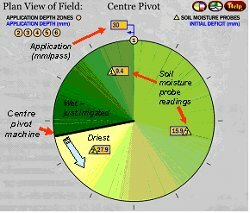 For centre pivots, the driest part of the field is typically immediately in front of the machine. However, for lateral move machines, the driest part of the field is typically at the opposite end of the field to the machine. There is also a need to consider ramping down the applied depth as the lateral move approaches the end of the field (and subsequently ramping up the applied depth as the machine moves away from the end of the field) to ensure that the field ends are not over watered. While traditional approaches to scheduling irrigations are focused on minimising crop stress, there may be significant benefits associated with using regulated deficit irrigation strategies. However, managing the crop to ensure that excessive stress is not applied requires extra plant growth monitoring and a detailed understanding of the crop physiology. The visualisation tool OVERSched (http://www.irrigationfutures.org.au/OVERsched/OverSchedv1-0.html) can be used to evaluate a range of scheduling strategies for CP&LMs (Figure 3). Figure 3: OVERSched examples showing soil moisture variations across a field under (a) centre pivot and (b) lateral move machines. CP&LMs traditionally apply the same depth of irrigation over either the whole field or large sections of the field. However, not all plants in a crop may require the same amount of water due to the stochastic nature of the crop response and the spatial variability of environmental factors within the field. The variable speed controllers currently available on most machines enable the applied depth to be varied with machine speed. However, few environmental or crop management variables only vary perpendicular to the direction of machine travel. Consequently, current research is investigating automated control strategies using sensor input to effectively manage spatially and temporally varied irrigation applications under centre pivots and lateral moves in real-time.